I’ve been trying to enter corrections to the Coptic section of my book. Unfortunately all I got from the translator was *paper* corrections. I don’t know the Coptic alphabet. Worse still, I’m working with Bohairic, using the Alphabetum unicode font, rather than the commoner Sahidic unicode fonts. What am I to do? Luckily we live in the age of the web. Here’s what I have done. 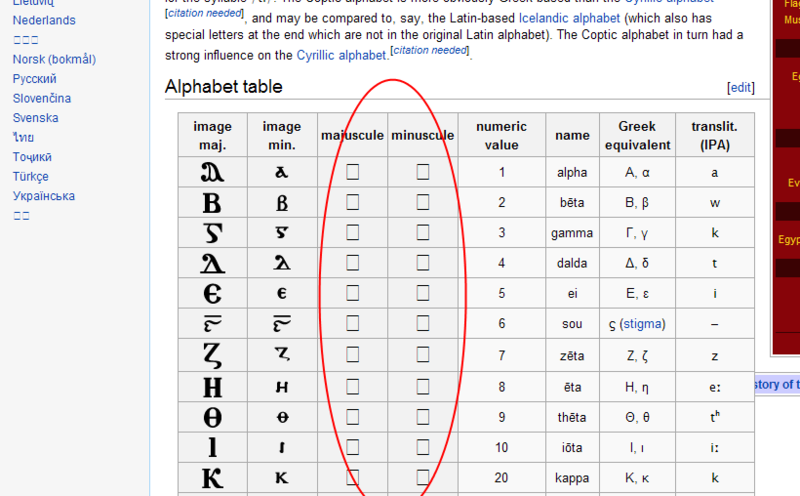 Firstly, look at the Wikipedia Coptic alphabet page. 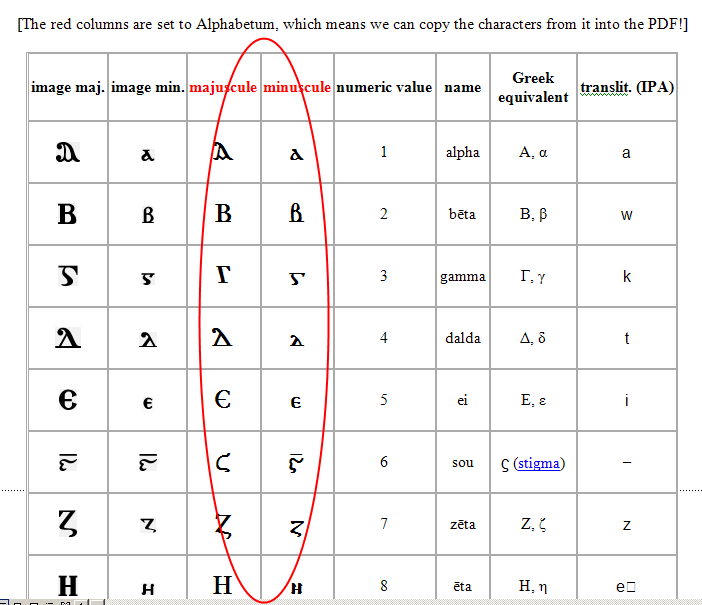 This has a really useful table, which shows and names all the letters with images. But it also has two columns which actually use a unicode font. Naturally these appear as squares, invalid characters. So what I did then was copy and paste the whole table into a Word document. The unicode characters remained invalid, mostly — hey, my default font is Times New Roman and it doesn’t contain these. Now what I can do is use these characters, and just copy and paste them, one by one. Yes, I still don’t know the alphabet. But I can compare the letter types against the images, against the word document. For small amounts of Coptic, it works. It would work for Sahidic as well, of course — just use a different font than Alphabetum. But … the translator talks about “supralinear strokes” whatever these may be. The Wikipedia article is silent on these. It is easier to enter Coptic Unicode characters if one has a customized keyboard, but it is also possible to enter any four-digit hexadecimal codepoint that you know using particular utilities in Mac OS X or Windows. … In Word for Windows, you can type a four-digit code (or a five-digit code) directly into your document and then type ALT-x, which converts the code to the character. The same page also gives a Coptic unicode keyboard for Windows XP, but that’s for people who know what they are doing. There are way better ways. You will need a keyboard layout, you can find one at http://www.logos.com/support/downloads/keyboards or you can use Microsoft Keyboard Layout Creator to create your own. If you are on Windows 7 or perhaps Vista you also need a virtual keyboard in which you can specify the font used to display the keys, I found Hot Virtual Keyboard (http://hot-virtual-keyboard.com/) working fantastic but it comes with a $30 price. You might find free alternatives. I use the New Athena (http://apagreekkeys.org/NAUdownload.html) font but any other Unicode font should work. Once you have the Coptic Keyboard layout installed you can switch between English and Coptic by selecting the keyboard from the language bar in your system tray. Launch the virtual keyboard. When you switch to the Coptic Keyboard you will see all your Coptic fonts on the virtual keyboard and you can type away with your regular keyboard to enter the characters. Thank you for these tips. I’m sure they are indeed much faster, once you’re set up. But if all you have to do is a few words, the approach I outlined will do it.